I don’t often make pancakes when I’m cutting. It’s not so much that I can’t have them, but more that there are other things that I prefer most times. I love mashing a sweet potato with vanilla protein powder and cinnamon. That’s to die for. If you haven’t tried it, you’re missing out. The other day I even turned down a soft serve ice cream cone just so that I could have my vanilla tater mash. Yes, that’s how much I like it. Every now and then I do get a craving for pancakes. That day happened to be this past Sunday. Right now I’ve got strict macros that I need to adhere to since I’m working towards contest. I had already figured out my meals for the day so I needed to come up with a recipe that fit into the remaining macros that I had left. I also wanted something chocolatey so that was another recipe criteria. 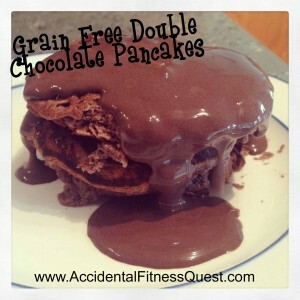 These double chocolate pancakes made with coconut flour hit the nail on the head. I love using coconut flour in my baking and usually have a bag of Bob’s Red Mill coconut flour in the kitchen. Mix the first 9 ingredients in a small bowl. I typically use stevia if I’m not using real sugar and I used 5 drops in my version of the pancakes. Use more or less sweetener depending on how sweet you like your pancakes. The batter will be pretty thick. Heat a skillet over medium heat and spray with non-stick spray. Drop 1/3 of the batter into the pan per pancake. My batter was thick enough that I had to use the spoon to smoosh the batter out into a pancake shape. Cook over medium heat until the top starts to look dry and flip. This took about 4 minutes on my stove. I peeked under the edge of one a couple times to make sure it wasn’t burning. After flipping, cook for another few minutes on the second side until done. I pressed lightly on the top to check for doneness. It should have a pancake feel to it and no longer feel squishy. Remove from heat and put on a plate. Mix the last 3 ingredients in a small bowl and add a little bit of water at a time until it is the consistency you like. Pour over pancakes like syrup and enjoy. Makes 3 pancakes with sauce for 160 calories for the entire recipe. Yes, just over 150 calories for THREE pancakes with chocolate sauce. I admitted on Facebook that I actually used my fingers on the plate to make sure there was no sauce left behind. I’ll definitely be making these again. I might even try adding PB2 to the mix for a peanut butter chocolate version. I’m pretty sure that this recipe would work with all purpose flour or whole wheat flour but I haven’t tried it. If you try it with a different flour type, let me know how it works out so that I can let everyone know.